This retreat will be tailored to you, if you want to take part in all the exercise sessions and activites then super but if you want to dip in and out and spend time relaxing, sunbathing and checking out the island you can choose to do that too. Imagine waking up in a beautiful villa in Ibiza, having some fresh juice, looking at the stunning scenery and gorgeous sun rising, then on top of that getting to workout, eat fresh, nutritious and tasty food, do interesting activities, meet likeminded people, sit by a gorgeous pool, experience the famous Ibizan sunset and more! Well you can do just that if you come to our fitness and wellness retreat from July 14th-20th at the stunning Can Amonita Villa. Pilates Plus Dublin and Diosa Hayya have teamed up to create a fabulous 7 days of ultimate fitness and wellbeing full of fun activities. In this retreat, we will focus on becoming fitter and feeling stronger as the week progresses, not forgetting our wellbeing and relaxation of course. It is a retreat based on feeling good about yourself, balance in health, fitness and life. You will have the more dynamic fitness sessions in the morning – Emma’s strength building pilates sessions, HIIT and dynamic yoga. In the evening sessions, you will experience more restorative sessions, from stretching to Yin yoga and meditation. You will experience Stand Up Paddle Boarding on the crystal blue waters of Ibiza, evening walk in the beautiful countryside followed by dinner in an organic farm under the stars, visiting the famous drummers on Benirras beach and much more. There will be plenty of time to nourish yourself by the pool, have a massage and explore Ibiza. You will be totally nourished with healthy yet delicious mediterranean food, fresh from local Ibiza farms. We make sure you will not go hungry on our retreat with plenty of food to satisfy you. 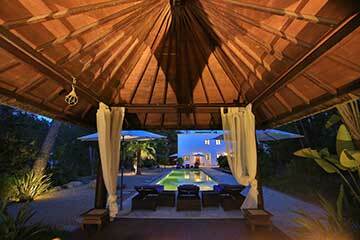 The villa Can Amonita is built purposefully for retreats. 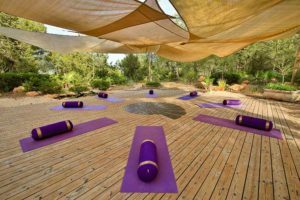 An outdoor yoga deck, a serene pool surrounded by pine trees and a Bali house where you can have a personalised massage, are just some of the chill-out areas you will find in the house grounds. This is not a detox retreat, but a fitness and wellness retreat where you will be nourished to compensate for the dynamic exercises. Our retreats are professional but offer a totally laid back atmosphere. To book and reserve your place, please pay €400 deposit. Full payment is due by 12 May 2018. A non-refundable deposit of EURO €400 is required to confirm your space and the full amount is due by 12 May 2018. In case of cancellation, the deposit is non-refundable. The remaining amount may be refunded up until 12 May 2018; 50% up until the 23 June 2018. No refunds are possible after 23 June 2018, unless a replacement is found.